(Moscow Times – themoscowtimes.com – Ivan Nechepurenko – July 30, 2013) In the shadow of a much more publicized mayoral election in the capital, the upcoming gubernatorial election in the Moscow region offers a decidedly different set of campaign issues, people’s demands and opposition activity. Unlike in Moscow, residents of the region that is often separated from the city by nothing more than the 10-lane Moscow Ring Road have less time to get involved in politics and want someone who will be less politically driven than anti-corruption campaigner Alexei Navalny, the star of Moscow’s mayoral race. On Monday, the Moscow region’s electoral commission gave the green light to the region’s main opposition candidate, Gennady Gudkov, approving 357 municipal deputies’ signatures in support of his bid. He is set to receive his official registration in the next few days, he said by phone. But news of this minor success for Gudkov was unlikely to be met with the same vigor in the region as it may have found in Moscow. As Russia’s second-most populous subject and the fourth-richest in terms of aggregate economic output, the region does not share the oppositional thrill of the capital. “The middle class is different there. People have to commute for 2-3 hours every day, and they have no leisure time to spend on Twitter, Facebook and Instagram,” said Alexei Chadayev, an expert in local politics and economics, and head of the Moscow Region think tank. According to the city’s transportation department, about 2.5 million people travel to the capital from the Moscow region each day. “As a result, people have different grievances: If in Moscow the so-called ‘creative class’ can sit in coffee shops and demand free and fair elections and war against corruption, the desires of their suburban neighbors are more utilitarian. They want better links to Moscow, they have environmental concerns and they want to work closer to home,” he said. This is the card that acting Governor Andrei Vorobyov, 43, is trying to play, according to Chadayev. After a recent promotional campaign that plastered his personal e-mail address on billboards along major highways, Vorobyov surely has a better idea of what the 7 million residents of the region he is managing want. The son of Deputy Emergency Situations Minister Yury Vorobyov, a close ally of Sergei Shoigu, the region’s former governor and current Defense Minister, the younger Vorobyov was the leader of the United Russia faction before he being appointed governor in November 2012. 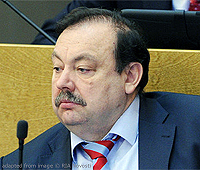 His main opponent, Gudkov, was also a long-standing State Duma deputy, but unlike Vorobyov had to leave amid scandal. The Duma stripped Gudkov of his mandate at about the same time when Vorobyov was appointed governor, after allegations that Gudkov was actively engaged in commercial interests while serving as a deputy, an activity forbidden by Russian law. Gudkov’s supporters say his ouster was a response to his prominent role in large-scale street protests against President Vladimir Putin. Vorobyov has not been immune to scandal either, with a recent plagiarism allegation by the group Dissernet putting him in hot water on Monday and prompting an inquiry at the Higher School of Economics, where he teaches. Vorobyov himself refused to comment on the allegations that he’d plagiarized his thesis, saying that he’d already responded to all questions about his dissertation while defending it in 2004. Despite these accusations, Vorobyov enjoys a huge advantage over his opponents, with 47 percent of residents in the Moscow region ready to support him, while Gudkov can rely only on 2 percent, according to state-run pollster VTsIOM. The situation in the region is complicated by the fact that is very diverse, with urban sprawl surrounding Moscow but villages and farms spread out in the more rural areas 100 kilometers away from the capital. “Navalny is clearly a brighter politician than Gudkov, but the situation in the region is very shaky; certain parts of it are depressed,” said Mikhail Vinogradov, a political analyst with the St. Petersburg Politics Fund. “In some parts of it, the ruling party may have a hard time winning,” he said.